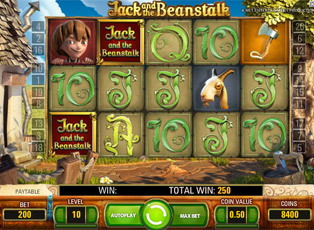 The Jack and the Beanstalk slot machine offers everything you expect from a modern video slot machine – and then some. This slot machine not only stands out with its design and quality, but also with its range of features that make playing this machine so exciting. These features include free spins, walking wilds and treasure hunt. Netent developed this slot machine, so players know what level of quality they can expect. The game’s introduction features amazing animations that are a joy to watch and form a great introduction to the game’s storyline. This slot machine has twenty win lines and is played on three rows and five reels. The number of win lines is set and cannot be lowered. The coin value is customisable between certain variables and players can also choose the amount they want to bet, up to a maximum of ten. The minimum coin value is 0.01 euro and the maximum value is 0.50 euro per spin. As mentioned, this game offers a variety of features. The walking wild is a common occurrence in the game. The reels can show several walking wilds at the same time. With each spin, they will move to the next reel, until they reach the first reel and the player gets their final re-spin. Having these walking wild symbols gives the player a much higher chance of winning money. All winnings earned with a wild combination will be multiplied by a factor of three. A player can also win free spins on the Jack and the Beanstalk slot machine. These are represented by the treasure chest symbol. Seeing three of these symbols awards a player with ten free spins. If you get another three treasure chests during the free spin round, you will be rewarded with an additional five free spins. The free spins lead to another unique feature: the treasure hunt. When the fifth reel shows a key symbol, this leads to an extra wild function. If you see three key symbols, a new wild – the stacked wild – appears in the shape of two bags of money. With six keys, you will see a stacked wild shaped like a golden chicken with three symbols. With nine keys, the expanding wild appears in the shape of a golden harp. Note that the walking wild can also appear during the free spin round. The re-spin with a walking wild symbol is the most common feature of the Jack and the Beanstalk slot machine. This is a unique wild symbol that few other slot machines offer. The extra treasure hunt feature during the free spins round is also truly remarkable. This slot machine is available to play for free in Kroon casino. To play for money, you must have a player account with some money deposited into it.